IDA Pro comes with an incredibly useful array of type information gathered from various compilers. Whenever a user names a location, IDA searches its currently loaded type libraries to see if that name is a known function. If the function is found, IDA applies the function declaration to that location. For example, Figure 1 shows an array of DWORDS. During reverse engineering, I determined that these are function pointers to MS SDK API functions. Naming the location with the corresponding function name causes IDA to automatically apply the type information. Figure 2 shows the result of naming that location GetTempFileNameA. The function declaration is shown above the line as a comment. Unfortunately, IDA does not automatically search function declarations any time someone creates a field of a structure. I've encountered this often enough that I've written a small IDA plugin that will perform this action automatically. As an example, I have a structure defined in Figure 3 used by a piece of shellcode. The disassembly in Figure 4 shows the call to the CreateProcessA field within an instance of this structure. Because there is no type information propagation, IDA's function analysis does not mark up the stack frame -- making it difficult to trace the parameters to the function call. After setting the structure field type, users should see a much nicer markup by IDA, as shown in Figure 5. It's possible to set these structure types manually, but doing so becomes tedious very quickly. A plugin that automates this process is available in the Mandiant GitHub repository here: https://github.com/mandiant/Reversing. struct_typer_plugin.py is the IDA plugin and must be copied to your %IDADIR%plugins directory. struct_typer.py is the actual IDA Python script the plugin calls. This can either be copied to your %IDADIR%python directory, or be in any directory in your %PYTHONPATH%. Running the plugin opens the dialog shown in Figure 6, which prompts users to select the structure to process. 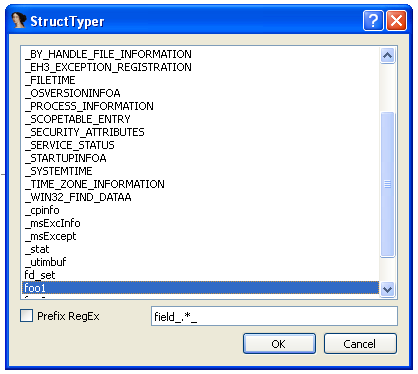 IDA then searches its currently loaded type libraries for each named field in the structure. If it finds a match, it sets the type to the corresponding structure field. When searching for matching names trailing _<DecimalValues>, the plugin ignores substrings. This attempts to mimic how IDA creates new unique names from a common base name by allowing CreateProcessA_0 and CreateProcessA_10 to both match the desired function CreateProcessA. Users can deploy the Prefix RegEx option to ignore the prefix string of field names. I commonly leave the field_<HexOffset>_ prefix when I name structure fields, so this option allows matching field_14_CreateProcessA to CreateProcessA. To create function declaration types, users must specify a compiler in IDA. 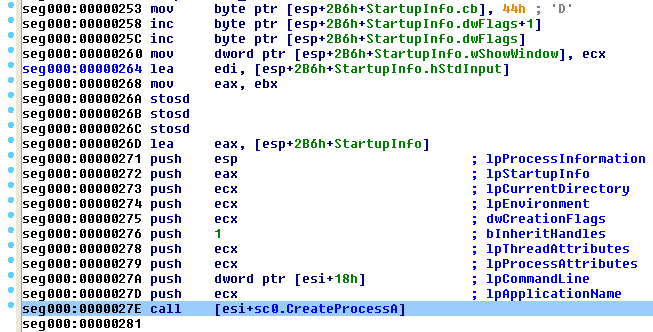 This should not be a concern for users who are reverse-engineering an executable format that IDA can identify. 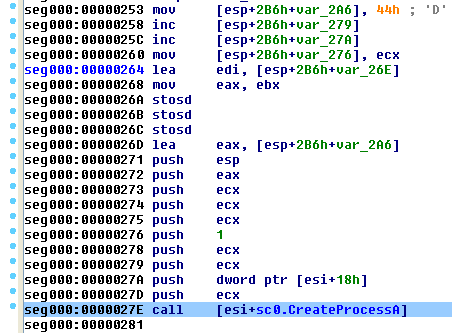 But to load a raw binary such as a piece of shellcode, users will need to set the compiler for IDA to use. 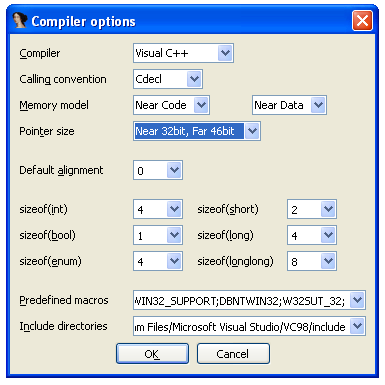 Selecting menu Options -> Compiler opens a dialog that prompts users to select the compiler vendor and specify some basic type information, as shown in Figure 7. It's important to remember that the plugin searches for function declarations in the currently loaded type libraries. Similar to the compiler options above, IDA may be able to correctly determine the type libraries to use if users are loading an executable with a known file format. To load additional type libraries, or to look at a binary blob when there are no loaded type libraries, go to menu View -> Open Subviews -> Type Libraries. This shows a screen similar to Figure 8. The view contains the current type libraries. To load new additional libraries, press the Insert key and select from the list. As a final point, I want to note that stack analysis in IDA is only done if the code can be marked as a function (usually shown as dark blue in IDA's navigation bar). Code that does not exist within a function is by default shown as dark red in the navigation bar. Code that confuses IDA's function analysis (such as shellcode due to techniques it uses, or software that employs anti-disassembly techniques) may prevent the creation of functions in IDA and hence limit the usefulness of this plugin. Patching the code in IDA may be required to allow creation of functions in the binary, but that is out of the scope of this post.